Today is my baby sister Micalyne's 60-somethingth birthday. For some reason she's always stuck at age 16 in my mind. Which makes her story a really strange one. Because she has two kids now. And one of those kids is like almost five years old. Which makes me really sad for my 16-year-old sister. But on the other hand, she has a pretty good job and owns a house. So, she's sort of an impressive 16-year-old. Why is my younger sibling 30 years more advanced in life than I am? Happy birthday, Muggy. Sorry for all those times I tried to get Cathie to walk fast in the grocery store when you were three because I didn't think you could keep up and I wanted to try to lose you. Looking out from the office. A wintry Salt Lake wonderland. I was hanging out with my friend Ben on Tuesday when we decided to purchase and consume an entire Baskin Robbins ice cream birthday cake. We asked the girl to draw anything she wanted on it. She drew a black cat. It's like she knew me. I'm very proud of these banana breads I gave out as office gifts. I feel like Pinterest is going to sue me over this. My 80-something year old grandma always gets such thoughtful Christmas gifts from her grandchildren. 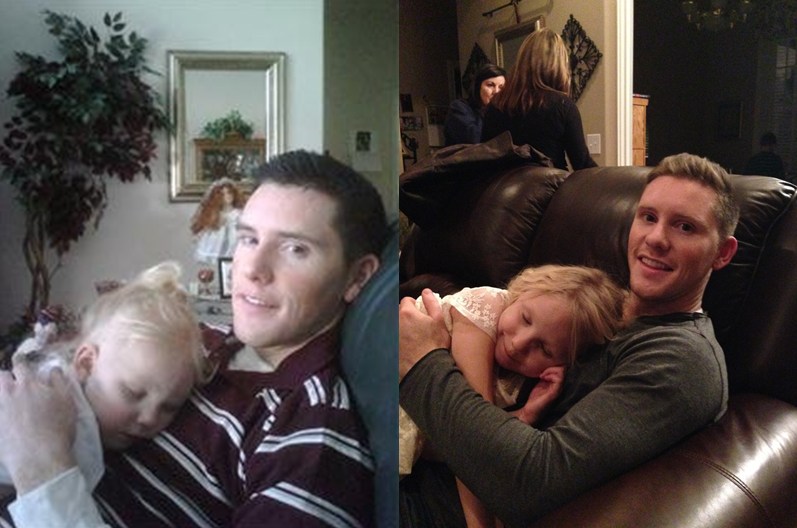 On Christmas day I was hanging out with my niece Kamree at my grandma's house when we realized we were sitting in the exact spot we were in exactly 6 years previously when the picture on the left was taken (please mock my black hair openly). So we recreated it. Except this time we included the slightest hint of eye wrinkles. From Taylor. "For Christmas my coworker got me a metal chicken. The Queen of Colors has been watching me while I work and it is a bit freaky." Godspeed, Taylor. May your soul be protected. 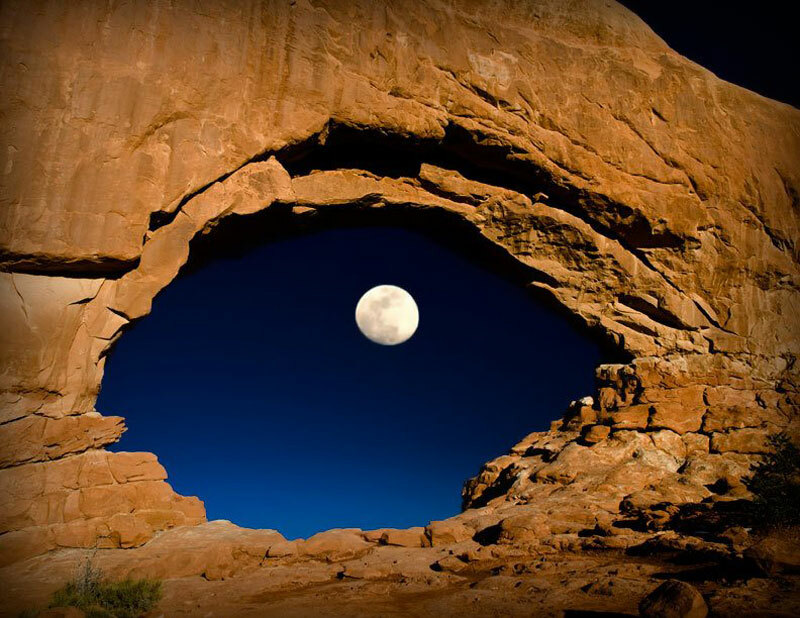 The First Eye in nature. Thanks, Magan. The first 24 hour music video. This is pure happiness. Thanks, Brian. A web cam set up on Abbey Road so you can make fun of tourists recreating the Beatles album cover. Thanks, Brian. Exploding spiders. Don't watch if you no likey spiders. Thanks, Margee. Bad engagement photos. Thanks, Kristi. Why don't I own this book!? Thanks, Chelsea. Go to this link. Press up up down down left right left right B A. Then just keep hitting A. Weird. Thanks, Brittany. A very important update on Macaulay Culkin. Thanks, Craig. The angry blog readers. Thanks, Bev. Ha! It took a few times for the Vogue thing to work. I was about to give up when Bingo! That was great! Sweet picture of you and Kamree. I hereby openly mock your black hair. SLC looks beautiful with snow! Good distractions from what I'm suppose to be doing. I have literally been looking at bad engagement photos ALL DAY! I think you'd enjoy @soverybritish on Twitter. Check them out. What I just keep wondering is: WHO FIGURED OUT THE VOGUE THING????? WHO?!?!?!? You've got to just follow the instructions! It's magical! 1) So, did y'all eat the whole cake? And if so, did you throw up? I love how amused she looks. 2) You SHOULD be proud of those banana breads! Not only do they look delicious, but the ornament tags are so cute and creative! Whatever you were saying about being a bad gifter was either a lie, or you seriously upped your game this year. I gave my coworkers cards and a candy cane... lame. Finally got the Vogue thing to work! Note: use caps. So great. And that video of MC is just plain weird. Eli I really wish you wouldn't post pics of your apartment and office, it makes it much harder to resist the urge to stalk you! Why would I want to make it harder for you to stalk me? In fact, here's my address: 2nd star to the left, straight on til morning, Salt Lake City, Utah. 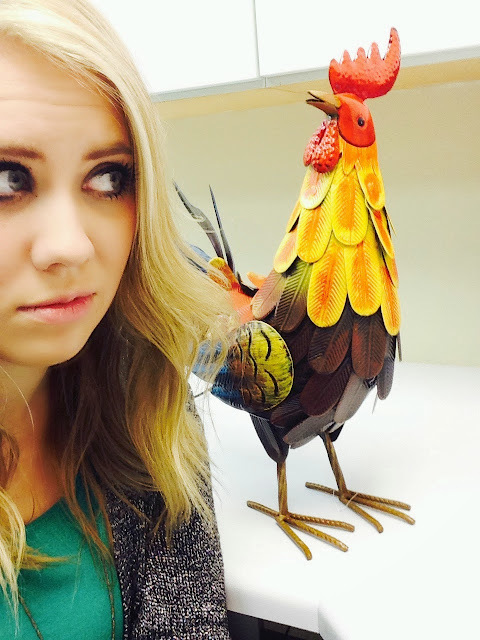 That metal chicken looks suspiciously like the love child of Beyonce the big metal chicken http://thebloggess.com/2011/06/and-thats-why-you-should-learn-to-pick-your-battles/ Is his name Blue Ivy by any chance? I'm still mad at you for not posting Sushi Cats. But a little less mad.